At U.S. Egg Restaurants, Arizona's ultimate breakfast and lunch dining spot in the Valley of the Sun for 29 years, we continue to build upon our success with made from scratch signature items. 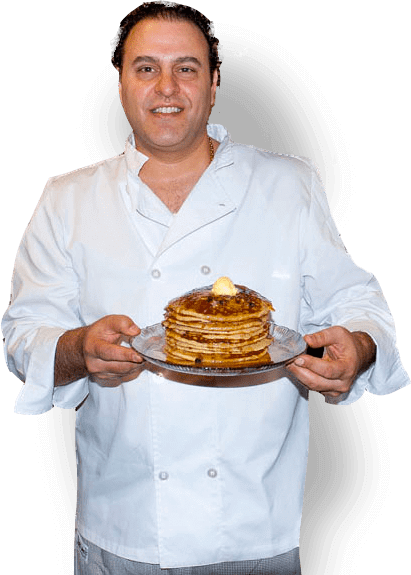 Best known for our protein pancakes, and our family friendly environment, at U.S. Egg we pride ourselves on offering healthy-minded options, in addition to meals that satisfy anyone's craving. The U.S. Egg Breakfast & Lunch Restaurant is a locally family owned and operated establishment with locations in Scottsdale, Tempe, Phoenix and Chandler. As home of the Original Protein Pancake, we have been serving our guests since 1986, our breakfast and lunch menu is served from 6:30 AM until 2:30 PM. Our breakfast and lunch menu has an abundant variety of delicious meals that will make any foodie scream “Score”! For starters, when you enter, the aroma of coffee and fresh baked granola immediately pleases the senses. The selection of fresh squeezed juices will hit the spot and, if you’re in the mood, our Mimosa and Bloody Mary offerings will give you a little extra kick to start your day. Our huge breakfast menu ranges from golden half moon omelletes, piping hot pancakes, sizzling honey cured bacon, mountain high skillets and specialty dishes for those who enjoy the dining adventure. The U.S. Egg defies hunger! The lunch menu is a force too. Our half pound burgers will conquer any appetite. Chicken sandwiches and gourmet salads will satisfy your taste for the lighter side of lunch. Be sure to wash it down with our selection of local brews like Kiltlifter, Mudshark IPA or an 8th Street Ale to name a few. Be on the lookout for our Gluten Free offerings as well. We have the largest Gluten Free menu in the state! From our Gluten Free waffle to the rich and creamy hollandaise you are sure to satisfy your savory or sweet tooth. The lunch side has several Gluten Free sandwiches available. You can also have your burger on a Gluten Free bun! Don’t forget the Gluten Free beer to go along with it. Above all else, a visit to our breakfast and lunch spots should include a taste of the Original Protein Pancake. The U.S. Egg's Protein Pancake is made from our fresh homemade whole wheat batter, sweet homemade high protein granola, Wild Maine Blueberries and cinnamon. Our signature dish has been adored by our guests for over 30 years. No other Protein Pancake compares. Our goal is for you and your family to enjoy the best dining experience we have to offer. The U.S. Egg is children friendly, offers Free WiFi, accepts large parties, spacious patio dining, loves to assist you with Take Out orders. So take a break and enjoy the best breakfast & lunch restaurant in Phoenix! Or Chandler! Or Tempe! Or Scottsdale! You get the point. The U.S. Egg believes that Corporate Social responsibility is vital for a healthy organization. Their business model isn’t about chasing the bottom line it’s about creating the triple bottom line which puts the people and the planet first which naturally increases profits. The U.S. Egg is committed to reducing its environmental impact and creating a personal and public profile as an environmentally and socially aware company. PEOPLE: Did you know the average age of a homeless person in Arizona is nine years of age?! As a local Arizona business, The U.S. Egg has decided to affiliate with many different homeless shelters in the sate of Arizona. Annual Pajama Drives help to raise money for shelters as well as the pajamas themselves. So far, they have succeeded with donating over ten thousand dollars to local homeless shelters and have raised over 1,500 pairs of pajamas. The U.S. Egg doesn’t bother to spend money on advertisement; instead they sponsor local sporting leagues while attempting to enrich the community as a whole. Overall they have sponsored over forty teams and are looking forward to many more! PLANET: In the US, restaurants are the top electricity consumer among retail businesses, accounting for 33%. Because of this The U.S. Egg decided to be “carbon neutral” at all locations!!! What is “carbon neutral”? Their “sustainability” plan encompasses three major business areas, the purchase of their products, the use of the products/facilities and the control of its output. Through the philosophy of reducing, reusing and recycling, The U.S. Egg is extremely committed to taking steps towards its part of a sustainable future. The U.S. Egg has spent the last few years shifting to more environmentally sound practices without compromising their business plan or amazing cuisine. Here are some key collective changes that have helped the business become more sustainable. Sustainability changes at the U.S. Egg have spanned a wide range of areas from switching to energy saving incandescent light bulbs to acquiring meats from a local food source. Also, they have started a recycling program within the shopping center at the Tempe location. The plan encompasses cardboard, paper, plastic and glass. Even down to the notepads they use come from in house recycled paper! Their deep fryer oil is donated to the Arizona Biofuel Company, where it is turned into an alternative fuel for vehicles. The U.S. Egg is committed to reducing the use of cleaning chemicals in their restaurants by also using an eco-friendly alternative, natural remedies and an eco-friendly carpet cleaning company. Saving used coffee grounds and offering them to their guests to help in their gardening is just a small way they make an effort to being responsible. At all locations, smart heating and cooling is used to reduce energy costs and keep up customer comfort. They have also installed an energy efficient device to save money every month. Expanding the storage space at the restaurants resulted in saving the emission of CO2 and fuel. By expanding it has reduced the number of deliveries from sixteen down to twelve a week, or 200 truck deliveries a year. Additionally, they have contracted with EcoAid to access their “carbon footprint” (our annual CO2 emissions) for all three locations, and purchased carbon offsets to be a fully “carbon neutral” organization. What is a carbon offset? In the future, The U.S. Egg hopes to partake in green purchasing programs of renewable and biodegradable disposable kitchenware and the most efficient kitchen appliances. They would like to switch to an alternative cup other than Styrofoam that biodegrades easier. In addition, the U.S. Egg will increase the use of eco-friendly cleaners and expand its recycling to all locations. U.S. Egg’s owner’s, managers, and staff are doing their part to contribute more sustainable methods within the restaurant industry. They hope that their commitment will show leadership for other restaurants in the future.